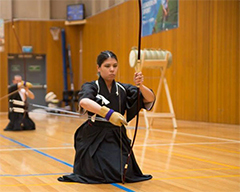 The Argentine Kyudo Association was established in 2004, with the purpose of the study, practice, and promote of the art of traditional Japanese archery. 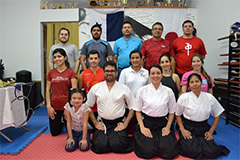 Members of the AAK currently train in two locations: Buenos Aires and San Carlos de Bariloche. The AAK currently teaches in the cities of Buenos Aires and Bariloche. In Buenos Aires practice is held in two locations in the neighborhoods of San Telmo and Belgrano. 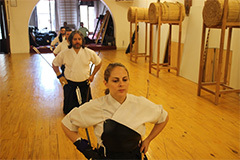 More information please contact us at: contacto@kyudobuenosaires.com.ar or Kyudobuenosaires@gmail.com. 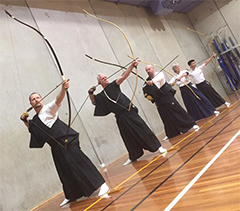 The Australian Kyudo Association (AKA) is the national body responsible for promoting and encouraging Kyudo in the Commonwealth of Australia. Since unofficial establishment in 2012 and its official incorporation in 2015, the AKA has grown to have clubs in over 15 locations across six states of Australia. 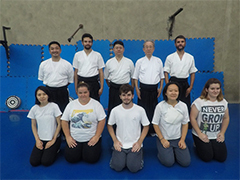 We have established “Internet Taikai” to help connect clubs from the east and west coasts of Australia as well as international clubs such as Malaysia in regular friendly competition, and we hold seminars with visiting sensei 5-6 times per year. 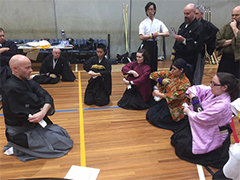 The AKA is currently focusing on connecting with the community to promote awareness of Kyudo, and planning for future opportunities to raise the profile of Kyudo in Australia. 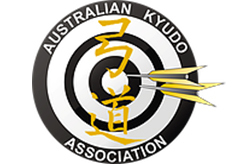 Any wishing to enquire about Kyudo in Australia are more than welcome to contact the AKA via the secretary email address below. 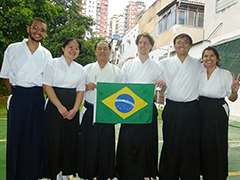 The Brasil Kyudo Kai (BKK) is a growing association with something around 60 members. Founded in 2008 in Rio de Janeiro, it has since its beginning the aim to help other groups across the country to establish themselves. 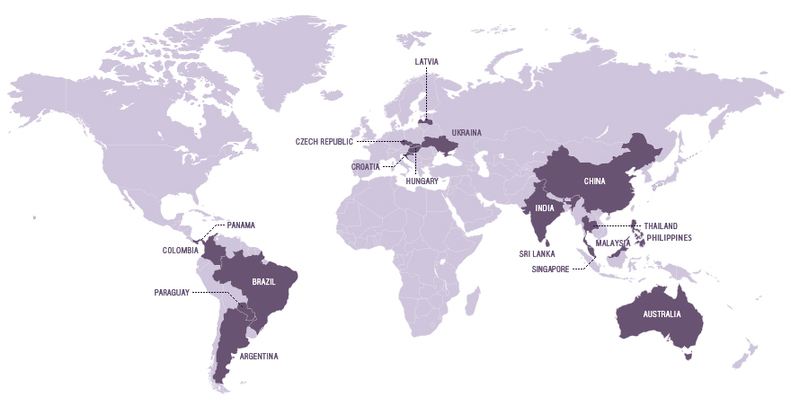 In the middle of 2018, there are nine formal groups practicing in Brazil under BKK orientation: Rio de Janeiro, Brasilia-DF, Sao Paulo, Salvador, Ponta Grossa, Curitiba, Teresopolis, Campinas and Manaus. The BKK sent its first formal delegation to the AKR/IKYF seminar in 2011. 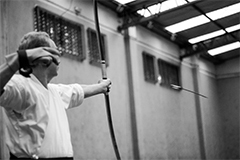 In 2014, Igor Prata won the second place in the II Kyudo World Cup (Paris), at 0-3 dan category. 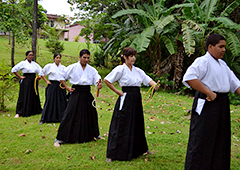 In addition to regular practice, we do demonstrations at community events to promote Japanese culture and the practice of kyudo. 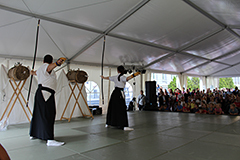 Public demonstrations at local Japanese culture festivals. GoRinKan(BJ) Group Co., Ltd, founded in 2005, locate in Beijing. 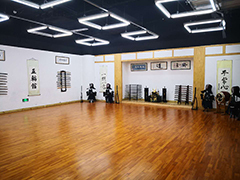 It is the first independence Dojo in China. 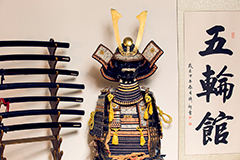 Kendo, Kyudo and other traditional Japanese martial arts are learn-able in our Dojo. 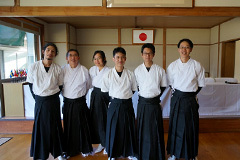 The Kyudo Dept. was founded in 2012. 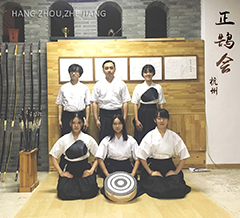 We can provide close range (28m) and makiwaras, with the teaching of the highest Dan holder in China. 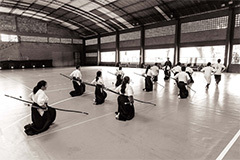 We are focusing on popularizing the Kendo and Kyudo culture. Welcome come to our dojo! 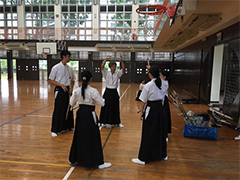 We started practice kyudo by the teaching of Naito sensei. 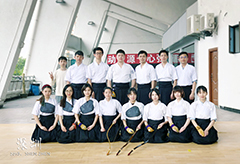 And we began our organisation “Seikoku Kyudo Kai” in Shenzhen City (Cuangdong, China) in April, 2011. 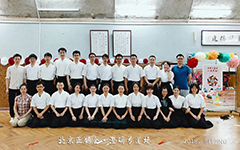 When our members came back to Shanghai City, they set up the Seikoku Kai (Shanghai) in January,2014, and HangZhou Seikoku Kai in Hangzhou City (Zhejiang Province) in July, 2016. 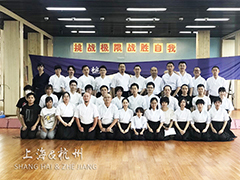 Our members also build a dojo named Chengming（澄明）dojo in Beijing in August, 2017. 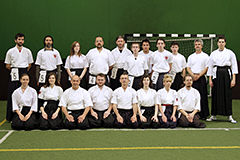 Croatian Kyudo Federation consists of three clubs, two in the Croatian capital Zagreb and one in the coastal town of Zadar. 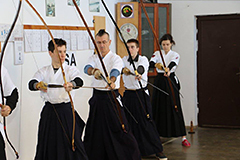 Since its inception, the federation was greatly supported and has kept close ties with the Austrian, German and Italian Kyudo Communities, which were instrumental in bringing Kyudo to Croatia. We also keep friendly ties with other regional communities such as Hungary and Slovenia. Our members are mostly Heki, but we also have a couple of shomen. 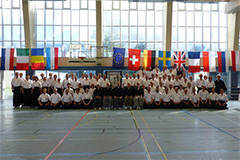 We regularly attend Seminars in Austria and Hungary and host our own with guest lecturers. 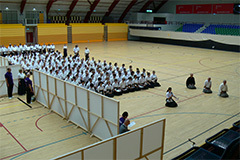 We also hold an annual National Taikai. 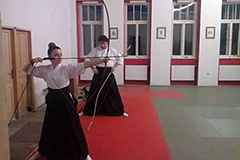 We would like to invite any kyudo practitioners passing through Croatia to get in contact, come meet us and train with us as our guests. 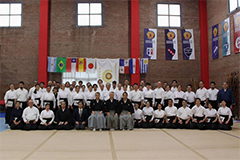 The Hungarian Kyudo Federation wishes to become an active member of the International Kyudo and to promote the Kyudo( Heki To Ryu) and the Japanese culture in Hungary. 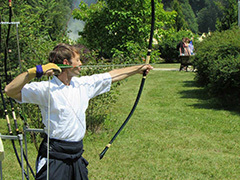 Latvian Kyudo association was established in 2008 for the purpose of development and promotion Kyudo in Latvia. 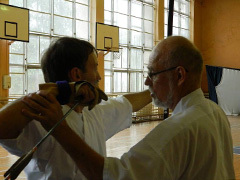 Latvian Kyudo association is a member of the European Kyudo Federation (EKF), and represents Kyudo in all state bodies and public organizations of Latvia, in the international sports activities and coordinates the development of Kyudo in Latvia. 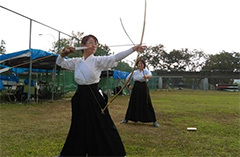 We have 2 clubs in Malaysia - PJ Kyudo Club (Shamen style / Heki-Ryu Insai Ha) in Central Malaysia and Penang Kyudo Club (Shomen style) in North Malaysia. 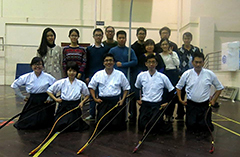 PJ Kyudo Club and Penang Kyudo Club meet quarterly for joint practices, friendly competitions and to organize public demonstration and tryout sessions for the promotion of Kyudo in Malaysia. 31, Jalan Setia 5, Jinjang Utara Tambahan, 52000 Kuala Lumpur, Malaysia. 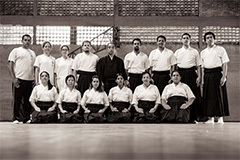 Kyudo Kai Paraguay was established in 2012, with the purpose to promote the practice and understanding of Kyudo in Paraguay, with the initial support of Brazil Kyudo Kai Rio de Janeiro. We are currently training three times a week in two different sport halls, at the SSDBCP in Asuncion and Nueva Acropolis Association in San Lorenzo city. 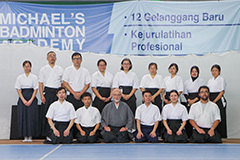 Special seminars with international graded members are held three times a year and beginners seminars every three months. 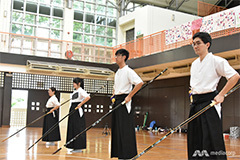 Regular exhibitions are scheduled in cities across the country to promote the contribution of Japanese culture in the west through the practice of Kyudo. 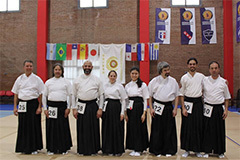 Koji Okabe sensei, Renshi Godan from the Argentinean Kyudo Association, is our permanent adviser and through the IKYF, we also count with the kind support of many other members that helps us improve in our Kyudo practice. 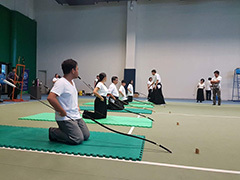 Kyudo Philippines group was created in 2017 by a french national resident in the country to answer the wish of Filipinos to discover and practice Kyudo. The group is growng in number and practice takes place in Makati (Metro Manila) every Sundays. 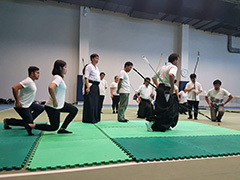 We focus on both taihai and shooting techniques equally, and also value character development. Our practice is the Shomen style but welcome other shooting styles to train with us. Siam Kyudo Kai was established in 2010 with the purpose to gather all Kyudo practitioners and promoting Kyudo activities in Thailand. We are currently practicing every Sunday morning at national archery field in Rajamangala stadium in Bangkok. 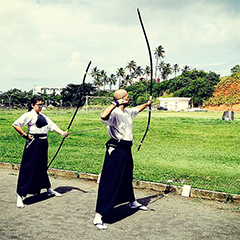 We share our knowledge and our door is always open for beginners and all Kyudo Practitioner. National Archery field in Rajamangala stadium. 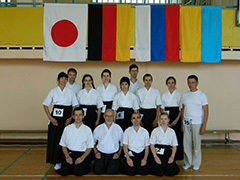 The Ukrainian Kyudo Federation was established in 2011 for the purpose of promotion of Kyudo in Ukraine. 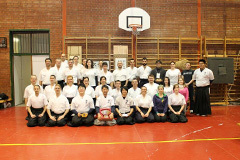 We have been on exchange with kyudo organizations in Russia, Hungary, Latvia, Germany, Spain and Japan. 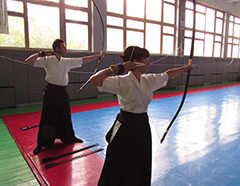 As part of our activity we represent kyudo in the local archery and martial art festivals as well as in cultural events organized by the Japanese Embassy of Ukraine. 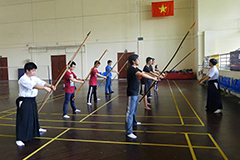 Kyudo club in Hanoi, this club established by Vietnamese youth. Almost all members are Vietnamese except 2 Japanese coaches.